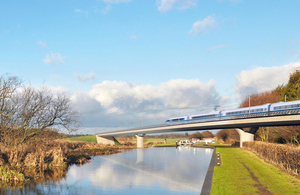 First recipients of the HS2 Phase One Community and Environment Fund and Business and Local Economy Fund are announced. Community projects along the new HS2 railway route will receive more than £245,000 as part of a £45 million pledge by the government to provide a legacy of improvements for generations to come, HS2 Minister Nusrat Ghani announced today (25 January 2018). A Northamptonshire pre-school, a 900 year-old Warwickshire church and an environmental awareness charity in London are amongst the first recipients of the Community and Environment Fund (CEF) and Business and Local Economy Fund (BLEF) - a £40 million fund to support local economies and communities affected by the Phase One construction of HS2 between London and Birmingham. Today HS2 Minister Nusrat Ghani visited Crewe station to announce an extension of the scheme – with a further £5 million being made available to help communities along HS2 Phase 2a route from the West Midlands to Crewe. HS2 will be the backbone of our national rail network – supporting growth and regeneration and helping us build a Britain fit for the future. Whilst we know there will be disruption as we deliver one of Europe’s biggest infrastructure projects, we are absolutely committed to minimising the effects of building the new railway. That is why I am delighted to see this significant funding helping to unlock the potential of communities and businesses along the route, ensuring the legacy of HS2 extends beyond the railway. These diverse and empowering projects will help regenerate local areas and bring people closer together, and I look forward to seeing more grants being funded in the future. These funding allocations highlight the government’s determination to ensure HS2 is more than just a railway, but a catalyst for economic growth, driving regeneration as well as improving the transport landscape around the rail line. The cash will be spent on public projects such as the refurbishment of community centres, nature conservation and measures to support local economies and employment. We have had a fantastic response so far and are proud to be supporting a variety of projects which will bring huge benefits to their communities for many years to come. More funding is available for eligible applicants in the HS2 Phase One area and throughout the construction of Phase One. We look forward to announcing more funded local projects for Phase One and the launch date for Phase 2a applications. As we deliver HS2, we have the opportunity to leave a positive legacy for the communities along the route of the railway. Our Community and Environment Fund, and its twin Business Fund, are starting to support important local initiatives, including building renovations and environmental projects. We’re encouraging local people to come forward with other opportunities, such as community-led nature projects which could contribute to the ‘green corridor’ we’re creating alongside the railway. This grassroots activity is in addition to the national benefits of HS2, which will rebalance the economy by connecting 8 out of our 10 biggest cities, increase rail capacity on the current system and reduce journey times, while also creating thousands of jobs across the UK.